Just in!! 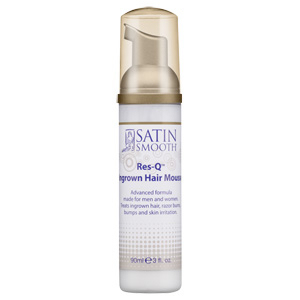 Satin Smooth Introduces Res-Q Ingrown Hair Treatment Mousse! advanced formula which treats ingrown hair, razor burns, bumps and skin irritation resulting from waxing, shaving, electrolysis and laser hair removal. These products will come to the rescue and save the day (all year round) from irritation and embarrassing bumps due to hair removing treatments. • Patented mousse formula penetrates skin quickly. • Enriched with antioxidants and calming extracts. • Restores skins pH level leaving your skin beautifully soft as silk.